WHEN MARS WAS SIMILAR TO JUPITER. The origin of the Mars dichotomy still remains, probably, one of the most intriguing riddle in the planetary system. If the Earth dichotomy could be explained by the tectonic activity then the Plutonic processes on the Mars did not reach such level in order to the global tectonics of the lithospherical plates could begin. For this reason, in order to explain the origin of the Mars dichotomy the external reasons of the disastrous nature became be attracted. However, any acceptable mechanism of such catastrophe explaining the whole complex of the features of the macro relief of the planet north hemisphere until was suggested. The reason of such position is probably concealed, first of all, in that the collision mechanism of a large asteroid with a stone body of the planet  is attracted. Such approach is stipulated by the empirical data on a large catastrophes happened with the Moon, Mercury and moons of the giant planets. The moon dates of such events have permitted us to estimate the time interval - 4±0,2 billion years ago - of appearance in the Solar system of a large pins population which caused the gigantic meteorite bombing of the Solar system bodies. At the end of the last century the idea of the temporary catch of the hydrogen-helium atmospheres by the Earth group planets during the process of their formation was repeatedly suggested . Besides, in the same century two space catastrophes have occurred which study results can throw light on the Mars dichotomy origin. Theses catastrophes cover the fall of the Tunguska meteorite (1908) and comet Shoemaker-Levy-9 on the Jupiter (1996). Let us imagine that at the period of gigantic meteorite bombing the Mars was still enveloped by powerful primary atmosphere (PPA) and had a commanding size that greatly increased the probability of its casual collision with the most large objects. And such a meeting once occurred. Further the events followed according to mechanical and gas dynamic models of an explosion, developed by the Soviet researchers even in 70-80 years of the last century for application to Tunguska meteorite [3-6]. Hyper-sized asteroide entered the upper layers of the PPA where burst or rather was exposed to explosion-like destruction above the modern north pole location which resulted in the occurrence of a complex system of ballistic and spherical strong shock waves in the atmosphere. Upon reaching the planet solid body surface, they (like gigantic rollers having passed from polar to equatorial latitudes) practically destroyed the post-accreation topography of the northern hemisphere and induced the lowering of the topography level by ~2 km in average. It may be well founded assumed that before the catastrophe the topography of the northern hemisphere slightly differed from the southern hemisphere. The spherical explosive shock wave was the first that reached the solid surface of the planet (in the north pole region). The angle of impingement of the shock wave edge gradually increased as the wave was propagating southward along the meridians. When its value became more than 450, the impinging shock edge merged with reflected shock edge  and the main shock wave was generated which is characterized by more higher pressures. There is good reason to believe that the prime shock wave started to generate at ~700 of north latitude where the traces of ancient topography are still available. If this assumption corresponds to the reality the altitude of the explosion is easily defined – it will be ~2500 km. When propagating further the main shock wave effected the soil more strongly comparing to the falling shock wave judging from the lowest area of the depression between 700 - 500 of northen latitude. 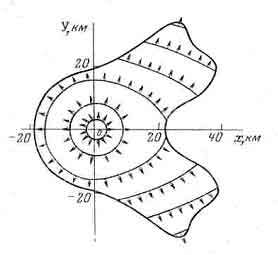 Fig.1 shows the plan of the depression in polar coordinates. The so called “coast” line where the ancient topography starts to emerge is assumed as the border of the depression. Through the Forsida eminence the border is assumed conventional because the evolved volcanic activity imposed its influence on the terrain. In spite the fact that the plan of the depression bears little resemblance to the plan of Tunguska tree-felling “butterfly” (Fig. 2a), the nature of these formations is the same. However, for the Martian option the ratio between the power of the object explosion and the power of object brake in the atmosphere was evidently more than that of at Tunguska and this resulted in the significant increase of the “butterfly head”. It is worth noting that the power of brake is the function of the body mass and depends on mean-square value of its diameter, and the power of explosion is the function of the body mass and depends on the value of the body diameter to the third. Besides, the combined interaction between the shock waves and Elisium and Forsida eminences could make their contribution to the increase of «butterfly head». In this and other cases the origin of the «butterflies» wings is explained by increasing the pressure on the ground along the lines of crossing the fronts of the explosive and ballistic waves. On the Mars the left «butterflies» wing is presented by Acidalia planitia and Chryse planitia, the left one by Isidis planitia and Syrtis Major planitia. If the wings of the Tunguska «butterflies» are placed symmetrically, the wings of the Mars «butterflies» are turned clockwise. If PPA together with the planet stone nucleus had a solid body rotation, the depression plan would be symmetrical. The turn of the «butterflies» wings to the side opposite the rotation of the planet uniquely indicates that PPA had a differential rotation, viz: the upper atmosphere layer rotated faster than deep one. Fig. 2b shows the design configuration of the Tunguska tree-felling plan executed by the V.P. 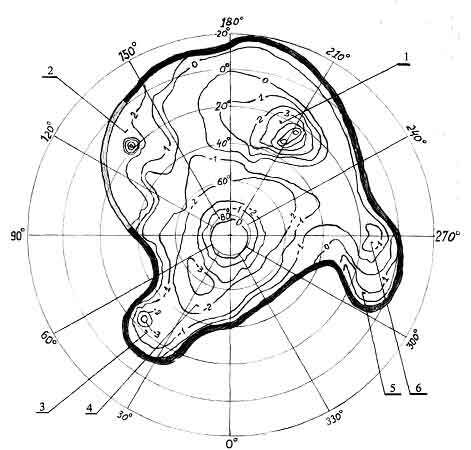 Korobeynikov’s group  for the 300 meteorite trajectory inclination angle on which the hollow between wings was clearly shown. Probably, in the first approximation and for the Mars super asteroid the same trajectory inclination angle should be assumed. Also, in the first approximation coming from the rational assumptions the size of the super asteroid at the first hundred kilometers can be estimated at r=2g/cm3 and collision on the counter courses. The origin of the flat impact craters of the South hemisphere can be explained by falling the planetzimals after their braking and parachuting in the powerful primary atmosphere at the final phase of the Mars accretion. 1 – Elisium uplift; 2 – Forsida uplift; 3- Chryse planitia; 4 - Acidalia planitia; 5 - Syrtis Major planitia; 6 - Isidis planitia. Fig. 2b. Calculated picture tree-felling for corner of the slopping to paths 300 and height of the blast on surface 5 km..
References:  Frey, H. et al. 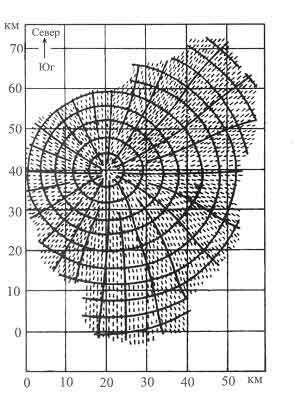 (1988) Geophys. Re. Lett. 15. 229-232. . Marakushev A.A. The Origin and evolution of the Earth and planets of the Solar system. M. Science, 1992. - 207с. . Pokrovskiy, G. 1976. Meteoritics.24. 108-110 (in Rus). . Grigoryan, S. 1976. Dokl. USSR. 321. 57-60. . Zotkin I.T., Cikulin M.A 1968. Meteoritics. 28. 114 (in Rus). Korobeynikov, V. et al. 1973. Meteoritics. 32. 73-89. . The Action of the nucleus blast. Izd-in "World". Moscow. 1971. Fast, V. 1971. Modern condition of the problem Tungus meteorite.